Accord-10 X 6 Stamped Steel Baseboard Register - White Discounts Apply ! Use white baseboard registers to replace stamped steel diffusers that are old and dented. These white baseboard registers are great for residential or commercial use. This stamped steel diffuser has a multi-shutter damper. This easily allows you to control air flow in your heating or cooling system. Furthermore, these white baseboard registers are a breeze to install. They come with predrilled holes and matching screws. All you do is insert the stamped steel diffuser and attach with the provided hardware. This stamped steel diffuser will fit a 10 x 6 hole. It has a projection of 7/8" and 1/3" spaced fins angled at 20 degrees. The white baseboard register has a steel construction making it sturdy. These diffusers have a bright traditional white finish that is also durable. - Overall dimensions of 11 1/4" x 7 1/4"
Additional white baseboard register sizes also offered. Looking for sidewall stamped steel diffusers to match? The industry standard is to measure the size of the actual hole in your wall to ensure the perfect fit register. This stamped steel vent cover will fit a 10 x 6 hole, and the faceplate dimensions will be 11 1/4" x 7 1/4". 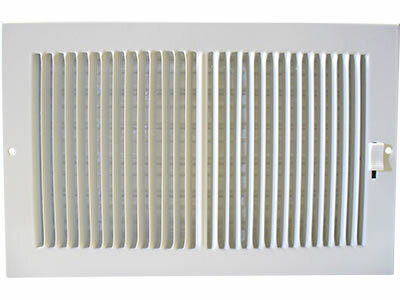 Buy these white baseboard registers today and see how easy replacing old stamped steel diffusers can be!